Metal Gear Solid Creator Hideo Kojima Working on "Super Confidential Project"
Hideo Kojima teases that his development team is meeting to work on a "super confidential project." It seems Hideo Kojima and his studio, Kojima Productions, are working on more than just Metal Gear Solid V for Konami. 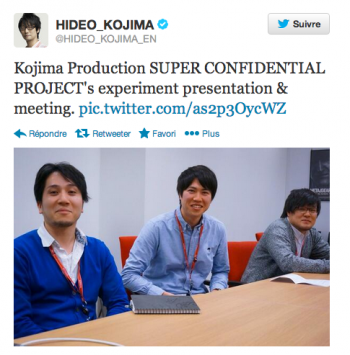 Over on Twitter, the legendary game designer tweeted , "Kojima Production SUPER CONFIDENTIAL PROJECT's experiment presentation & meeting," which included an image of three unnamed staff members. With MGSV still brewing over at the studio, could this "super confidential project" be downloadable content or expansions for the series' fifth main entry or something entirely separate? Your guess is as good as mine at this point -- though I wouldn't mind if this was somehow connected to a new Snatcher or Policenauts game. If you had to hazard a guess, what do you suppose this secret project is all about? Perhaps a new entry in the Zone of the Enders franchise, a new IP, or yet another entry in the Metal Gear Solid series? For more on Metal Gear Solid V, you can read up on how Ground Zeroes' ESRB rating revealed that the game will include "sexual violence." Metal Gear Solid V: Ground Zeroes will be released this March 18 for the PS3, Xbox 360, PS4 and Xbox One; while it's other half -- MGSV: The Phantom Pain's -- release window has yet to be announced.